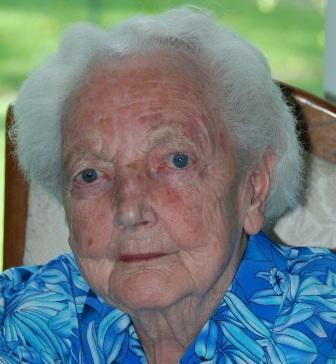 The family of Mabel Wilkie is saddened to announce her passing on October 4, 2016 at the age of 101 years. Born in Ballygrooby, Ireland, on September 10, 1915, Mabel is survived by her children, Patricia (Boyd) Morris of Kamloops, BC, Shirley (Dave) Mitchell of Hughenden, AB, Marilyn MacNeil of Kelowna, BC; eight grandchildren, Glen (Monica), Sherry (Mike), Terry (Dolores), Tracy (Daryl), Kenny, Colin, Trevor (Sylvia) and Pamela (Jeffrey ); 10 great grandchildren, Katelyn, Ryan, Colby, Colton, Sydney, Kira, Bradley, Ashley, Braelyn, Drycen and many nieces and nephews. Mabel was predeceased by her husband, Emil Wilkie, son, Edward Wilkie, sisters, Agnes, Kathleen and Winnifred, and by her brother, Jim. Mabel immigrated to Canada by boat with her family in April, 1926. She grew up on the homestead of Athabasca, Alberta where she helped her family with the duties on the farm. At eighteen, she left home to help her sister cook for a mill crew at Priddis, Alberta. It was there that she met her future husband, Emil and on September 14, 1936, they were married. In 1938, Mabel and Emil moved to Burmis and shortly after had their four lovely children, Patricia, Shirley, Marilyn and Edward. Mabel had a hard but full life and enjoyed every minute of it. Her priority was her family and there was never a time when she wasn’t worrying or taking care of someone. She loved being outside and tending to her yard and garden. When she wasn’t outside, she was in doing housework, playing cards, knitting, crossword puzzles, ironing, etc. There was always something that she was doing as she wasn’t known to sit idly by. The family would like to thank the nurses and doctors for their loving care of Mabel during her time at Royal Inland Hospital and Ponderosa Lodge in Kamloops, BC.